1. In a large saucepan, brown the chicken cubes in the heated oil. Remove from pan and set aside. 2. Using the same pan, fry the onions for 2 - 3 minutes, add celery and green pepper cook until tender. Return chicken to saucepan. 3. 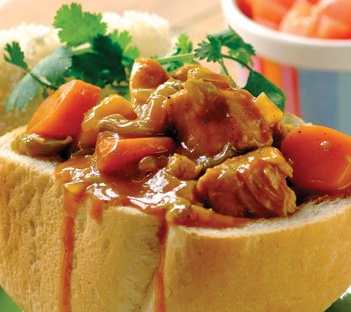 Add the water and stir in the IMANA Mild Natal Curry Cook-in-Sauce. Add potatoes and carrots to the saucepan. 4. Cover and simmer for 30 - 40 minutes to 1 hour or until chicken and vegetables are tender. 5. Slice loaf into 4 equal pieces. Scoop out contents and fill with chicken mixture. Place bread that was scooped out on top. Your bunny is now ready to serve. 1. In a bowl combine all the sausage meat, onion, breadcrumbs, parsley, margarine and eggs, Lastly add half the dry contents of the IMANA Mushroom Sauce packet. Mix together until well combined. 2. Place the chicken in a roasting pan and stuff with the prepared stuffing. Tie the legs together with string. 3. Rub the oil over the chicken and then rub the remaining IMANA Mushroom Sauce over the chicken. 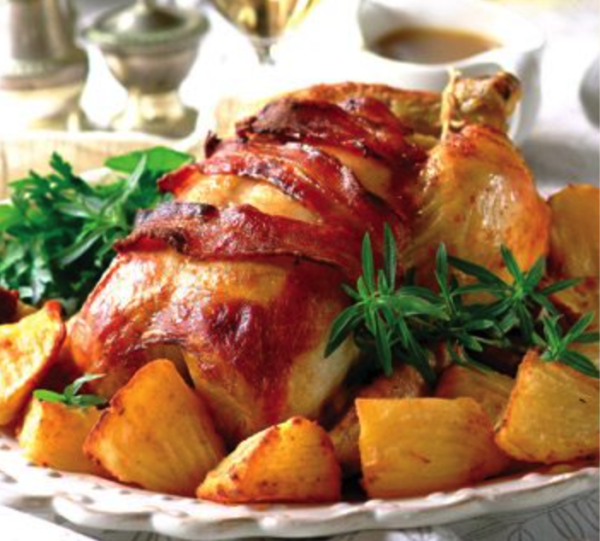 Place the bacon rashers over the top of the chicken. 4. Cover with foil or the lid of the roasting pan. 5. Roast at 180°C in the middle of the oven for 1hour. Remove the foil and continue roasting for 15-30 minutes. 6. To check if the chicken is cooked, push a knife into the thickest part. If the juices run clear, it’s cooked. Allow the chicken to rest for 15 minutes before carving. Prepare the IMANA Roast Chicken Gravy as per the instructions on the pack and serve with the meal. 1. Thaw the chicken at room temperature. Place in a large pot and cover with water. Add the IMANA Chicken Super Stock Cube. 2. Bring to the boil and simmer for about 20 -25 minutes to par cook the chicken. Remove from water and allow to cool. 3. Combine the dry IMANA Cream of Chicken Soup powder, flour, pepper and baking powder in a bowl. Add the milk, water and egg gradually to form the batter. 4. 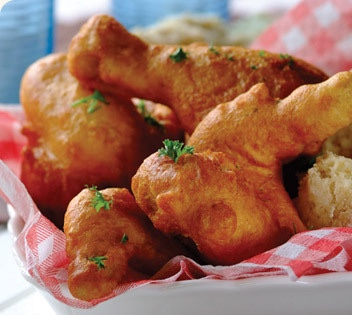 Coat the chicken in flour then dip in the batter. 5. In a deep fat fryer or a large saucepan, heat the oil. 6. Add chicken 2 – 3 pieces at a time and fry for about 20 minutes until cooked through. Drain on paper towel. Mix flour and IMANA No. 1 Chicken Soup together. Roll chicken portions in it until completely coated. Fry chicken in oil until golden. Place the portions in an ovenproof dish that has a lid. In the same pan, pour out excess oil, then fry the onions and green pepper until soft. 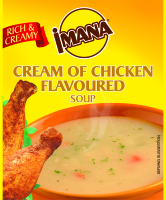 Add the IMANA Gourmet Country Chicken Stock Cubes, dissolved in boiling water. Mix together mustard sauce, chutney, sugar and IMANA Super-Sheba Relish Chicken Barbecue flavour and stir into the stock. Spoon sauce over the chicken pieces. Cover with a lid or foil and bake for 1 – 1 ½ hours at 160°C. Serve hot with generous helpings of rice. 1. 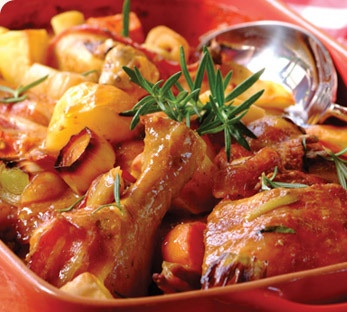 Place chicken pieces in a large casserole dish, rub the margarine into the chicken and cover with the slices of bacon. 2. Place the vegetables around the chicken. 3. 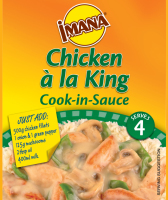 Mix the contents of the IMANA Mild Natal Curry Cook-in-Sauce with 400ml water and pour over the top. 4. Cover the chicken with a lid or foil and cook at 180°C for about 1 hour, or until cooked. 1. 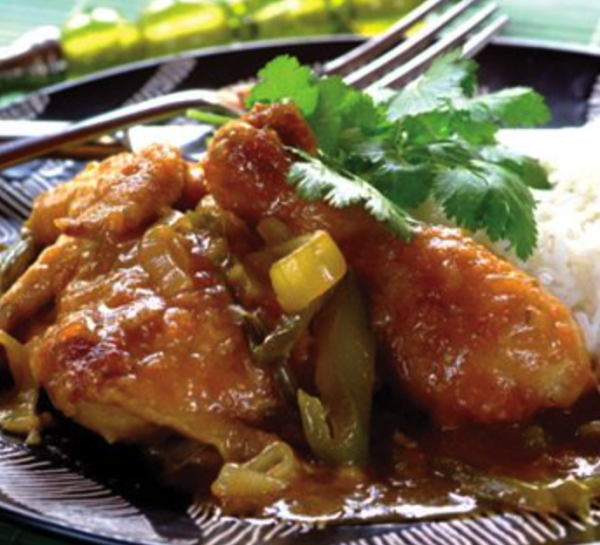 Place the coconut milk and water in a saucepan, then stir in the IMANA Chicken a la King Cook-in-Sauce and curry paste. Bring to the boil. 2. Add the chicken pieces and onion and simmer for about 10 minutes or until the chicken is cooked. 3. Add the green beans and cook for a few more minutes (the beans should be crunchy). Stir in the dhania. 4. Meanwhile cook the rice as per packet instructions and season with salt. Place the desiccated coconut in a heated pan (without oil), and dry fry until golden brown. Stir into the cooked rice. 5. 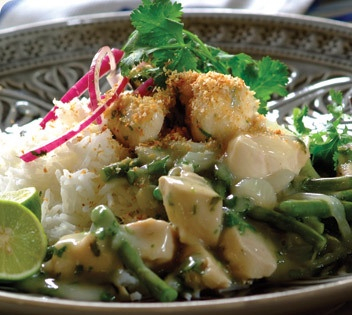 Serve in individual bowls with rice topped with the chicken curry. 1. Fry the livers in heated oil until browned but still slightly pink inside. Remove and set aside. 2. 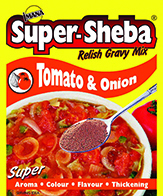 Blend the IMANA Super Stock Cube Chicken Flavour, water, tomato & onion mix, chutney, sugar and Peri Peri Sauce and pour into a pan. 3. Heat until the sauce comes to the boil. 4. Add the livers and IMANA Super-Sheba Tomato & Onion Relish Gravy Mix and cook until thick and livers are heated through. 5. 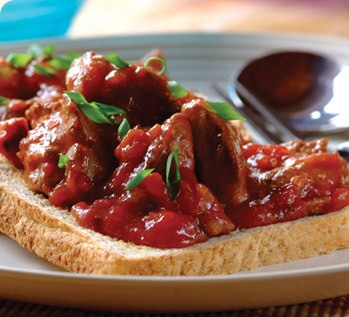 Serve on bread, toast or over steaming pap.